Read an interview with Rowan McCandless on her essay. Read an interview with Rami Schandall on her poem. Read an interview with Janika Oza on her story. Read an interview with Lishai Peel on her memoir. Laura Zacharin, "How Did You Get to Grief Class"
Melinda Price Wiltshire, "Young Woman at the Edge of Light"
Margaret Christakos, "Three for One"
Emily Osborne, "Dark ceilings" and "If time devours"
Armand Garnet Ruffo, "Pink Mints" and "Filament"
Nancy Lee, "The Ends of the Earth," "New York," and "Late October"
Conor Kerr, "Directions to the Culture Grounds"
Triin Paja, "Urn of Nettles" and "Ööbik"
Sue Sinclair, "Service" and "The Washing Place"
Jane Akweley Odartey, "Conversing with the Farmers"
Shashi Bhat, "Good Enough Never Is"
LAUREN ALBIN, co-translator of Kim Hyesoon’s A Cup of Red Mirror (Action Books, forthcoming), teaches English and Creative Writing at Agnes Scott College in Decatur, Georgia, USA. AMY ATTAS is a writer, tree planter, and hocky referee who lives in Victoria. Her essays have appeared in Room. She keeps a book review blog at amyattas.com. SHASHI BHAT’s fiction has appeared in The New Quarterly, Grain, Best Canadian Stories, and Journey Prize Stories. She won the 2018 Journey Prize, and was a National Magazine Award finalist for fiction. Shashi is the editor of Event. TIM BOWLING is the author of twenty books of poetry, fiction, and non-fiction, which have earned him two Canadian Authors Association Awards, five Alberta Book Awards, and a Guggenheim Fellowship. His latest collection of poetry is The Dark Set: New Tenderman Poems (2019). DAVID GRIFFIN BROWN edits fiction for the Darling Axe and designs fractal-dyed clothing for Terran Attire. His forthcoming novel is Sky to Sea. MAGGIE BURTON lives in St. John’s, Newfoundland and Labrador. Her poems have been published or are forthcoming in Room, Riddle Fence, and Grain. She received a 2017 NL Arts and Letters Award for poetry. MARGARET CHRISTAKOS lives in Toronto. She has published ten collections of poetry, an intergenre memoir, and a novel. Charger will appear from TalonBooks in 2020. 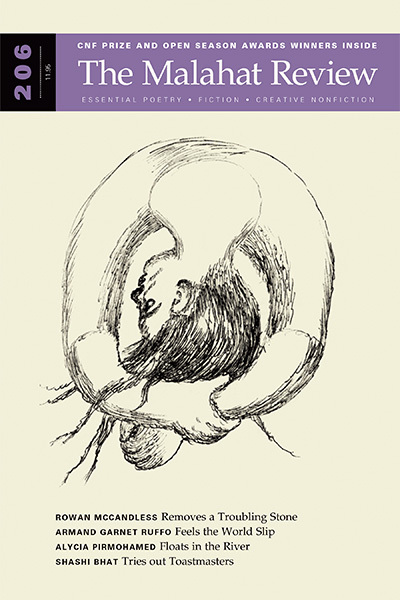 WLU Press published Space Between Her Lips: The Poetry of Margaret Christakos (2017). JAMIE DOPP has published articles, reviews, poems and stories in many journals. With Angie Abdou he co-edited Writing the Body in Motion (2018), on Canadian Sport Literature. KYLE FLEMMER is an author and cat-dad from Calgary, current managing editor of Filling Station, and founder of The Blasted Tree Publishing Co.
ROBERT HEDIN’s most recent collection is At the Great Door of Morning: Selected Poems and Translations (2017). He lives in Frontenac, Minnesota. NOZOMI IMANISHI, an award-winning script writer and cook, lives in Vancouver. Her aspirations change often, but today it is to learn how to deepfry the perfect sourcream doughnut. MICHAEL KENYON’s most recent collection of poetry is Lamb (2018). A collection of fiction, Travellers May Still Return, is forthcoming from Thistledown Press. CONOR KERR is a Métis writer from Amiskwaciy Waskahegan enrolled in the MFA program at UBC. He works at the Indigenous Student Centre at NorQuest College, Edmonton. KIM HYESOON uses grotesque language and images to examine the state of feminism in South Korea. Her poetry in translation includes Sorrowtoothpaste Mirrorcream, I’m Okay, I’m Pig!, and Autobiography of Death. NANCY LEE is the author of Dead Girls (short stories) and The Age (a novel), both with McClelland & Stewart. Her poems have appeared in Canadian Literature, CV2, Event, PRISM International, Occulum, and The Puritan. ROWAN MCCANDLESS writes from Manitoba’s Treaty 1 territory. Her story “Castaways” was long-listed for the 2018 Journey Prize. Her work has appeared in Skin Deep: Race and Culture and is forthcoming in The Fiddlehead and Black Writing Matters. ROSE MORRIS is a freelance writer and editor in Vancouver and a member of Room Magazine’s editorial collective. Follow her on Instagram @rosalie_morris. SHEILA MUNRO writes memoir, essays, and reviews, and is the author of Lives of Mothers and Daughters: Growing Up With Alice Munro. She lives in Victoria. STEVE NOYES recently earned a PhD in Writing from University of Kent. He is the author of nine books of fiction and poetry, most recently November’s Radio. He lives in Metchosin. JANE AKWELEY ODARTEY is a Ghanaian-American poet, writer, photographer, artisan whose poems have appeared in Clarion Magazine, North Dakota Quarterly, and Cosmonauts Avenue. She blogs at janethroughtheseasons.com. SUSAN OLDING is the author of Pathologies: A Life in Essays. She lives in Vancouver. EMILY OSBORNE is the author of Biometrical (2018) and a forthcoming book of Old Norse poetry translations, Quarrel of Arrows. Her poetry has been published in CV2, LRC, Barren Magazine, The Antigonish Review, and elsewhere. JANIKA OZA is a writer, educator, and graduate student in Toronto. She was a 2018 VONA/Voices fellow and a scholarship recipient from GrubStreet in Boston. Her work has been published in several journals, including The Columbia Review, Into The Void, and Hobart. Find her at janikaoza.com. TRIIN PAJA lives in rural Estonia. Her poetry has appeared in Prairie Schooner, Portland Review, Room, and elsewhere. Her collection of poems in Estonian, Nõges (2018), won the Betti Alver Literary Award. MITCHELL PARRY has published two poetry collections: Tacoma Narrows (2006) and Imperfect Penance (2008). He teaches Film Studies at the University of Victoria. LISHAI PEEL is an award-winning poet, creative consultant, and community animator with roots in diasporic oral tradition, co-founder of Ink Veins: Young Women’s Writing Collective, and co-author of a graphic novel, Why Birds and Wolves Don’t Trade Stones. ALYCIA PIRMOHAMED is a Canadian-born poet studying in Scotland. She won the 2018 Ploughshares Emerging Writer’s Contest in poetry, and her work has appeared in Prairie Schooner, PRISM International, The Adroit Journal, Poetry Book Society, and Room. MELINDA PRICE WILTSHIRE’s fiction, poetry, and reviews have appeared in Grain, The Antigonish Review, The New Orphic Review, and Celebration of Canadian Poetry. She has an essay forthcoming in Queen’s Quarterly in 2019. ARMAND GARNET RUFFO’s new collection of poetry, Treaty #, will appear shortly. His writing has appeared in Best Canadian Poetry, ARC Poetry, Granta: Canada Issue, Event, and 150, Canada’s History in Poetry. He is the Queen’s National Scholar in Indigenous Literature at Queen’s University, Kingston. RAMI SCHANDALL is a writer, artist, and designer who has lived and practised in Toronto since the turn of the century. “Timepiece” is her first published work. AARON SHEPARD, from a small town in British Columbia, is author of When is a Man (Brindle & Glass, 2014). He is currently writing a novella triptych. SUE SINCLAIR is the author of five books of poems, most recently Heaven’s Thieves (2016), recipient of the Pat Lowther Award. Sue lives in Fredericton, New Brunswick. DAG T. STRAUMSVÅG is author of A Bumpy Ride to the Slaughterhouse and The Lure-Maker from Posio. He lives in Trondheim, Norway. JILLIAN TAMAKI is an illustrator and comics artist living in Toronto, and co-creator with her cousin Mariko Tamaki of Skim and This One Summer. Her own graphic novels include SuperMutant Magic Academy and Boundless. LAURA ZACHARIN’s poems have appeared in The Fiddlehead and are forthcoming in CV₂. Her first book, Common Brown House Moths, is forthcoming from Frontenac House.